BAD BOY (1925) --- Among rollicking anecdotes Leo McCarey told was the time he fell down an elevator shaft and shattered both legs. Sound like fun? Humor was different then. Roughhouse came natural to a tougher breed for whom broke limbs was the breaks, and to be expected, so no wonder slapstick came sudden and sometimes cruel. 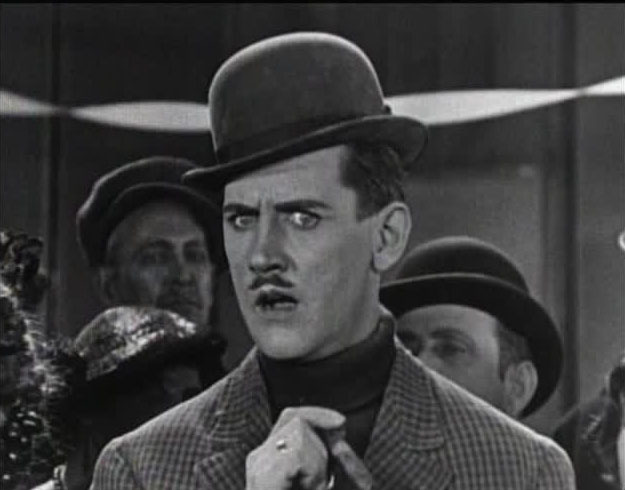 Not that Charley Chase's were at Larry Semon level of carnage, but he and McCarey knew well, and bonded on realization, that life dealt jokers far more often than a pat hand, and the best comedy (like theirs) needed to reflect this. How much should we credit McCarey with quality of Chase comedy? Some among auteurism's membership would give it all to the future potentate of screwball. They'd score up McCarey for Laurel and Hardy's success as well. I'll say it was 75% Chase at point of Bad Boy (the second starring two-reeler he did), and acknowledge that for learning/improving all the time, McCarey's percentage would increase as did progress of the series. Maybe by teaming time of L&H, he was the guiding genius, and it was Laurel who learned from LMc toward flourishing of a Stan/Babe partnership. I do know McCarey credited Chase with teaching him everything he knew, this a gracious hindsight from well after Charley had passed on. Maybe it's enough that McCarey was a more than promising newcomer and Chase had mature enough appreciation of talent to let the younger man find his level so everyone could benefit. What's obvious is advantage to Bad Boy of an added reel, Charley Chase a comedian who needed relax time to set up his character and situation. The mama's boy and timid suitor was a good start, and worked so long as Charley had appearance of youth. 20's audiences liked laughing at any antithesis of go-getting that served as model for men, the halting and frequently embarrassed Chase persona a blueprint CC would keep, with minor variation, for the rest of a career. Bad Boy set a standard for Chases to come, and it was high. Most of his with McCarey were at least as good, the larger part surviving thanks to Pathe-released shorts being sold on 16mm to home collectors. THE PEARL OF DEATH (1944) --- I'll go on a limb and venture that The Pearl Of Death, along with The Lodger, was the scariest movie released in 1944. Censorship was stringent upon horrors, but mysteries could and did get away with content I'd call horrific. The monster here is Rondo Hatton's Creeper, built up throughout as a fiend given to back-breaking his victims. Hatton's real-life acromegaly made for a frightful, if afflicted, face emerging from shadows to final reel confront Sherlock Holmes. I don't know any Universal fiends at the time so engaged as this Creeper, who'd be back as the company's horror brand wore down, but never so effectively as his first appearance here. The Pearl Of Death goes familiar Holmesian route of the detective's rush effort to gather related objects that will explain murders and unmask the culprit. Pearl relates too with Uni horrors via use of Evelyn Ankers as disguise-prone henchwoman to master-minding Miles Mander. Holmes at Universal never struck me as B level, each and all entries handsomely produced and solid set-decorated. Lost count years ago as to number of Pearl views, but there'll be many more thanks to Blu-Ray boxing of the fourteen title series. 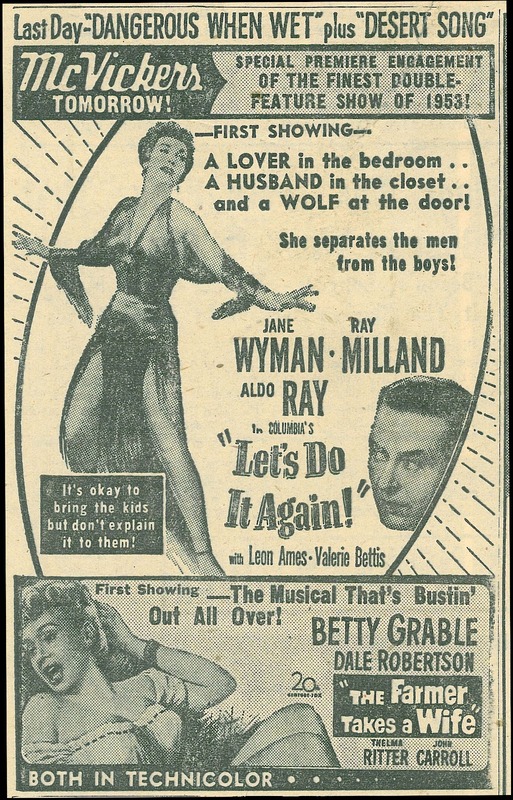 LET'S DO IT AGAIN (1953) --- Broadway composer Ray Milland spends a feature's length wooing back wife Jane Wyman before their divorce becomes final. Done at Columbia where musicals weren't generally a patch on even what Warners released, all studios save Metro having cut back spending for such. Someone by this time had decided that Wyman should sing (and often), our endurance depending on individual taste, or lack of, for this performer (Let's Do It Again like a continuation of her character from Just For You). Competing with Milland for Wyman's hand are Tom Helmore and Aldo Ray, both sans notable aptitude for music or farcing, but game withal and offbeat assets to Let's Do It Again, itself approaching the cliff from which old-style musicals would plunge once rock and roll arrived to shake/rattle the genre. I watched mainly because TCM ran a gorgeous transfer from Columbia. Writer Richard Matheson later said he got his idea for The Incredible Shrinking Man from a Ray Milland-Tom Helmore hat switch gag here, one instance of a mediocre film inspiring a classic one. 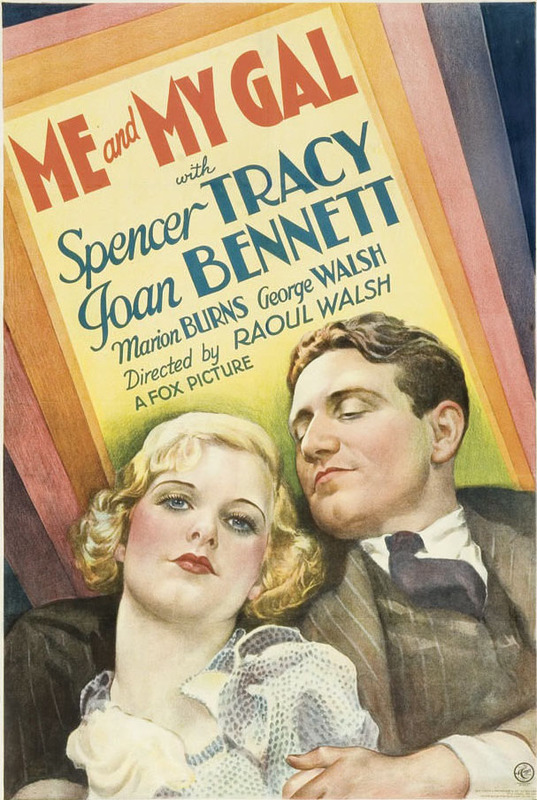 ME AND MY GAL (1932) --- Much humor of a men's smoker sort as cop Spencer Tracy bird-dogs sassy waitress Joan Bennett, their battle of will/wits enlivening a Fox programmer fortunately directed by Raoul Walsh, him being primary reason for modern interest in the pic. Watch co-stars here, then in Father Of The Bride, and know how radically their images, and the biz itself, would change over less than two decades. Gal's another precode where amusement lamps switch on and off --- on when Tracy/Bennett parry, distinctly off where a tiresome drunk on fringes overstays his less-than welcome. Walsh's humor was a type that would depart as movies got more genteel, thus occasional head-scratch as to what made his funny-bone vibrate (obviously lots of the drunk indulged here). Me and My Gal is a privileged glimpse of 1932 time passed for a dime's admission, and orchids to TCM for dredging it up. 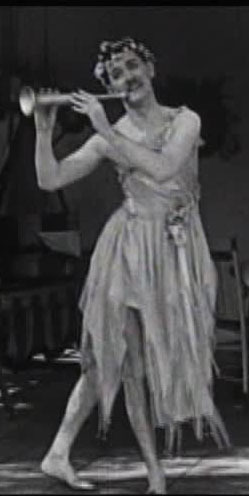 Watching multiple Charley Chase silents back to back is a revelation; the guy's batting average was pretty astounding! DVD collections bring to light one quality that's often overlooked in accessing classic clowns from ancient times... dependability. A lot of the greats spent much of their short subject careers on a hit or miss path (think Langdon or even Chaplin). Some folks might consider Chase 'minor' when looking at one comedy out of context, but viewing film after film you realize he pretty much delivered the goods every time out! If McCarey was even partially responsible, kudos to him! PEARL OF DEATH... my favorite Universal Holmes. 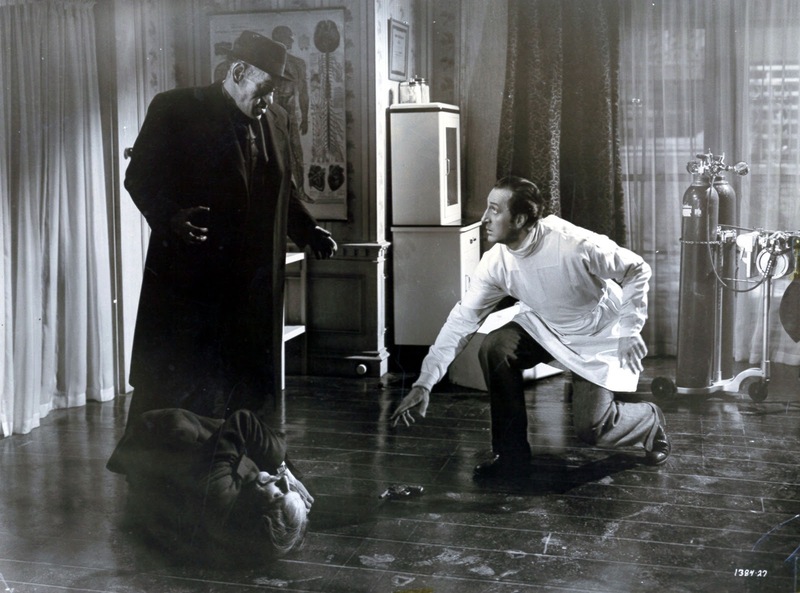 Love that flash of genuine panicky terror Rathbone displays before he plugs Hatton. I mean, Sherlock is really scared! Haven't seen ME AND MY GAL in decades but I seem to remember a funny bit about STRANGE INTERLUDE. Or am I getting this one confused with some other early talkie? Great selection, as usual, terrific comments. Hi Dave --- Chase did have a high average, in his silents especially. Milestone's "Cut To The Chase" DVD set is a nice source for many of these, with sixteen shorts on two discs. With regards "Me and My Gal," there is a gag referencing "Strange Interlude." Not sure if "Pearl Of Death" is my favorite Holmes, but I can't offhand think of a better one. The early Spencer Tracy movies are great fun -- fast-paced, wisecracking -- and "Me & My Gal" is no different. There's an actor in it -- can't remember the name -- playing Tracy's partner on the police force. He resembles (vocally and physically) John Candy and, for me, steals every scene he's in by playing it so naturally. But as I recall, his character played no real importance. You could've eliminated him and not alter the story at all. 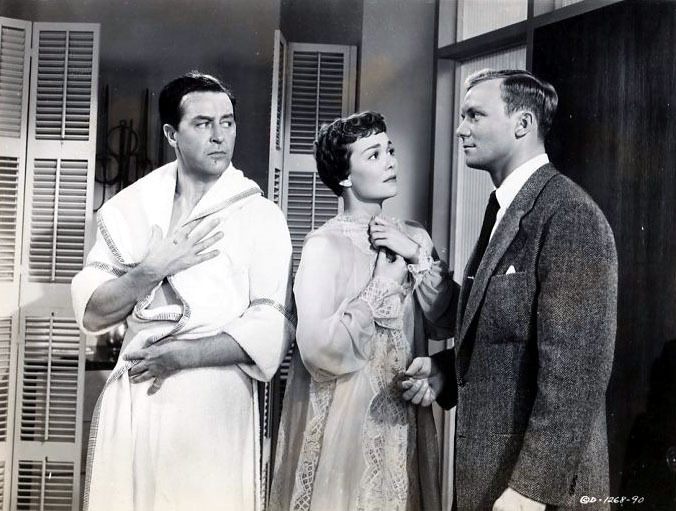 A gem for me from Let's Do It Again is Jane Wyman's singing of "Slow Burn". Great song and arrangement and Jane does it justice. I like Jane's voice. 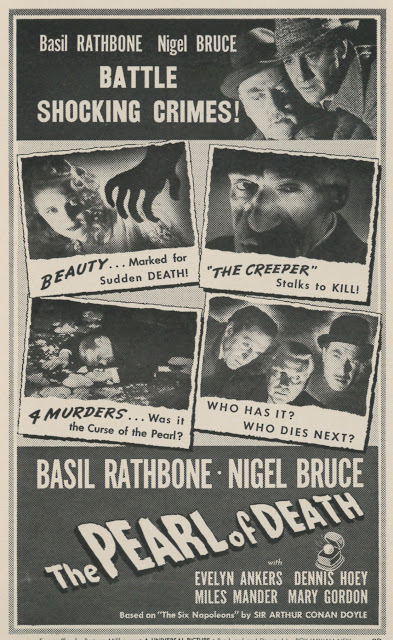 The Pearl of Death, "the scariest movie released in 1944" (along with The Lodger)? Well, it's good, but I'd pair The Lodger with The Uninvited for 1944's scariest double feature. Charley Chase's run of Pathe two reelers from 1925 through 1927 are an astonishing group -- two dozen comedies, each with different gag situations carefully built up that don't overlap or repeat, almost every film a gem. The only track record comparable are Laurel & Hardy's silent MGM shorts of 1927-1929. The few Chase MGM silents that escaped a fate of nitrate decomposition (such as THE STING OF STINGS and LIMOUSINE LOVE) are equally outstanding. Could you imagine if all the missing Charley Chase two reelers eventually turned up and we discovered that his success rate continued unabated? I'm surprised that there's no mention of LET'S DO IT AGAIN being a credited remake of Leo McCarey's THE AWFUL TRUTH, particularly with the discussion of another McCarey film at the beginning of the blog.